Customized especially for your wedding with your names. These are 3 Packs of 16" inch High Quality 7 Function Foam Sticks, the best of the Bunch. 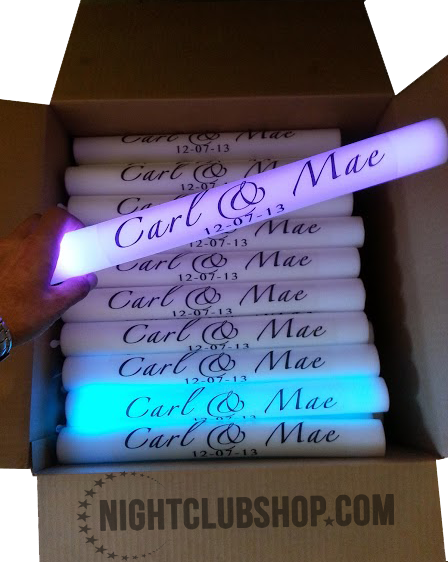 Each and every one of these LED FOAM STICKS is Custom Printed with your WEDDING ARTWORK or a GRAPHIC DESIGNER will put together what you envision for your special date. 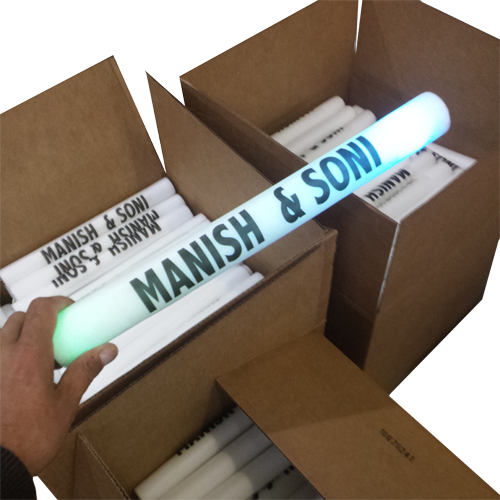 The 16" Inch LED FOAM STICKS are what NightclubShop highly recommends for the higher quality, Higher end Events such as weddings, corporate events, and upscale shin-diggs. There is a big quality difference in the 16" and 18" LED FOAM STICKS, primarily in the LED Lighting functions (3 vs 7) as well as a much higher grade standard in construction, brightness, and durability. The 16" LED FOAM STICKS High Quality are the only ones we carry that actually change from one solid color to another, and have the RGB Color change sequence integrated making them GLOW in various selections of Colors as well as a Mixed Flash mode that changes colors randomly. The 18" LED FOAM STICKS Do not dothis, they have 1 Blue, 1 Green, and 1 Red LED Light inside of them and they just Blink at 3 Different speeds. They areboth very fun to hold and dance with, but as far as quality and a productfor a Higher End event such as a WEDDING, the 16" LED FOAM STICKis the way to go, and with this specific 3 Pack order, or multiple 3 Pack Orders, it is the print Quality ATTENTION, the individual perfection and detail that counts. Each of the WEDDING 3 PACK LED FOAM STICKS are individually tested and checked before they leave our warehouse. Also look at our Bride and Groom customized Promo glasses that are great for weddings. These have been getting very popular in alot of weddings, The Brides and Grooms love them! These 16 inch 3 Pack LED Foam Sticks are perfect party favors for an exclusive group within your event. Such as a set for the groomsmen and another set for the bridesmaids. Show importance to select individuals within your event with these eye catching multi-color LED Glow Batons.